Almost every day I come across businesses that are destined to fail. Why? Because either they have no USP or a poorly thought out USP. 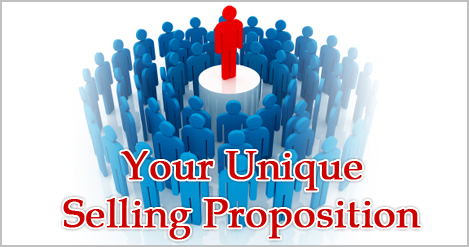 EVERY business needs a USP, which stands for “Unique Selling Proposition” or “Unique Selling Point”. Whatever definition you’ve heard, the key point is your business MUST have a unique benefit when compared with other competing businesses. Your business MUST have something that makes it stand out from the crowd. Once you’ve decided on your USP, the next challenge is to promote it. If you look at your competitor’s website, you should be able to discover their USP’s fairly easily. It might be mentioned on the homepage or it may be in the “about” section of their site. Armed with your research , you can now look inwardly at your own business and determine what YOUR USP should be. Is there a gaping hole that’s not being filled? 1) What do they really like about your current business? 2) What would they like you to do or provide? 3) What frustrates them about other businesses that they’ve tried for the same product or service? Use the survey results to decide on your USP. It’s valuable information on which to base YOUR USP. Don’t make the mistake of guessing what customers want– I can tell you that we’re wrong almost every time. 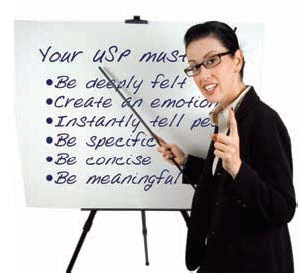 Armed with your new USP, you need to hone it into a more exciting phrase. Their USP is speed , but they phrase it in a dynamic way. Create a dynamic phrase for your USP then prepare to promote it. Side Note: These days your USP pretty much has to guarantee something.